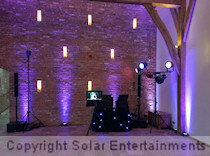 Solar Entertainments specialise in combining a fantastic karaoke service with our professional, top quality mobile disco and DJ hire services for Private Parties, Corporate Events and Weddings. We have a huge amount of experience combining karaoke and disco hire to mixed functions of all kinds including birthdays, children's parties, engagements, weddings, civil partnerships, corporate events, theme nights, Christmas and New Year parties. Much of our work comes to us via repeat customers or referrals from previous happy customers. We are very proud of this and work hard to maintain our excellent reputation within the industry and with our customers. Please see our Reviews section for comments from our past customers. Our karaoke and disco service includes all of the benefits explained on our "Disco Hire" page, plus the karaoke specific benefits outlined below. Our selection of karaoke songs is the result of many years of keeping our list up-to-date and of meeting the requests of our customers. We have a huge variety of songs available and our complete song listing is available to download at any time from our website at the following link: Karaoke Song Listing. Our song listing includes all the karaoke classics, all the very latest releases and everything we've ever been asked for. We have songs covering all eras from pre-war to the latest chart hits. Songs are available in all popular genres including Pop, Rock, R&B, Indie, Dance, Disco, Rock & Roll, Party, Swing, Motown, Soul, Reggae, Irish, Children's songs, Musicals, Opera, Old-time Sing-alongs and of course songs for birthdays and Christmas. As well as providing the facility to download our complete karaoke songlist prior to your event, at each event we provide A4 sized, clear and well presented karaoke listings ordered by Artist Name, Song Title and by Era and Artist. Each book includes an attached pen and request slips for writing out karaoke requests. There is no requirement for disc and track numbers as our entire karaoke collection is held digitally. Therefore requests can be made simply by writing the artist and song title. As singers ourselves we know the importance of using high quality, professional equipment for karaokes and a DJ that knows how to set it up correctly for every individual singer. All equipment is of high professional grade. A great sounding karaoke makes a huge difference compared to that which many people may have experienced at an average pub event. Our setup is suitable for any standard of singer to ensure our karaoke events are enjoyed by everybody, including people who can 'really' sing! Our equipment has been used to provide audio for professional singers and even West End musical stars at a number of wedding and corporate events. Combined with our professional sound equipment we also include flat-screen televisions for our singers and audience participation as well as lighting as detailed on our Disco Hire page. LED lighting is used to light our singers. Smoke and haze machines are also available, venue permitting, but are only supplied upon request. Our karaoke collection is stored and played digitally using the latest state-of-the-art playback software. This allows us to find and play karaoke songs very quickly and eliminates problems inherent with using CDs or older software, such as corrupt or out of sync lyrics and jumping tracks. Our digital karaoke also allows us to change the key and tempo of songs to suit our singers, greatly increasing the song repertoire for many people. 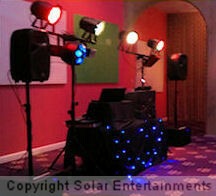 We have been combining karaoke and disco since 1998 at a huge variety of events. Our experience allows us to combine karaoke and disco expertly without allowing the atmosphere or flow of an event to be disrupted or allowing the karaoke element to get out of hand. 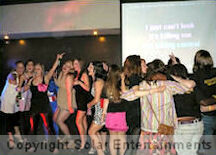 Every event and audience is different and our experience allows us to combine karaoke and disco appropriately for each. If you would like to make an enquiry, please complete our Online Enquiry form. This form ensures we have all the necessary information required to check availability and to provide you with full details and an accurate quote. If you have any queries regarding our services, or would like to talk to us about anything else, please see our Contact page for our telephone numbers and email addresses. 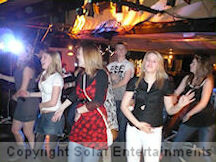 Thank you for visiting our website and we look forward to providing you with a first class entertainments service! Greater Manchester, Derbyshire, Humberside, Lincolnshire and Nottinghamshire.